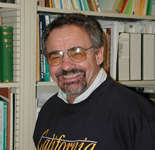 Jere Lipps works on both modern and fossil marine organisms, protists in particular. His current research takes him to Russia to collect and study Precambrian animals, to tropical Pacific Island reefs to study living foraminifera, and to the coasts throughout the Pacific to understand shallow-water assemblages through time. Read the interview with Dr. Lipps to find out more. Camping along the shores of Russia's White Sea with Misha Fedonkin (left) and Jim Valentine (center). "It is not an insuperable difficulty that Foraminifera have not...progressed in organization since even the Laurential epoch; for some organisms would have to remain fitted for simple conditions of life, and what could be better fitted for this end than these lowly organized Protozoa?"  Astronomy Picture of the Day. Visit the archives to see lots of fantastic images.  The Tree of Life. About the diversity of life on Earth. - Earth from Space. Images of Earth from NASA's Space Shuttle.  Beneath Los Angeles. Taphonomy of the famous and not so famous. - Endurance. Alfred Lansing, McGraw-Hill, New York. 1959. - In the Heart of the Sea: The Tragedy of the Whaleship Essex. Nathaniel Philbrick, Viking, New York. 2000. - Woe Is I, the Grammarphobe's Guide to Better English in Plain English. Patricia T. O'Conner, RiverHead Books, New York. 1996. -Any book by Charles Darwin.